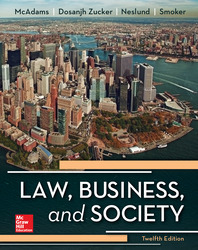 Interdisciplinary approach: Elements of law, political economy, international business, ethics, social responsibility, and management help students build a logical understanding of the regulatory process. Analytical thinking: Contemporary legal and ethical conflicts emerging from today’s news, polls, data, and research provoke students to think deeply about the law and policies in place. Connect: An easy-to-use homework and learning management solution that embeds learning science and award-winning adaptive tools to improve student results.